For a limited time, Steam is offering seven independent Unreal Engine games for a mere $20. If you've played nothing but a handful of major game releases, the odds are still pretty high that a couple used the Unreal Engine. Developed by Epic Games, it's currently among the most popular gaming engines used for licensing, and powers everything from Arkham City to XCOM Enemy Unknown. Large studios aren't the only ones using Unreal however; several indie developers have also licensed the engine for their own projects. In the interest of showcasing what smaller teams can do with a triple-A engine, Steam has unveiled a limited time Unreal Indie Bundle that offers seven unique games for $20. 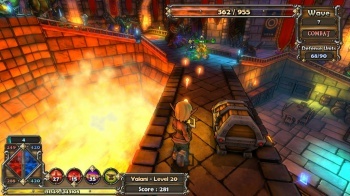 The full bundle gives players a wide range of gameplay options to choose from. Fans of tower defense games get the action RPG Dungeon Defenders and the FPS-based Sanctum. Anyone interested in mind-bending puzzles can test their logic with Q.U.B.E, Unmechanical, and the adventure-themed The Ball. Finally, shooter fans get to try the humans vs dinosaurs-inspired Primal Carnage or the more casual and experimental Waves. Each game in the pack individually costs either $10 or $15, so even if just two or three interest you, you'll still get your money's worth. The Unreal Indie Bundle will be available on Steam until May 5th.